Outside of God there is no hope. Remove God and you have not touched one of the sufferings of the world. You have perhaps added one. You have not touched one of the pains and pangs. You have only removed the One who might help. The disease is untouched. You have only taken away the remedy. Outside Christ the problem of suffering is insoluble. To dethrone God in a throe of anger and bewilderment is merely to hasten death by indeliberate suicide. … If Jesus Christ and He weeping is not the answer, then there is no other. If in Him is not found Hope, elsewhere there is only Despair. Ashes on our foreheads, we begin Lent. We have been marked. Our physical bodies bear the outward sign of an indelible interior one. Ashes are a stark symbol. They add to the many crosses that have been traced over our bodies since our Baptism. Between the oils of gladness and the anointing of burned ash, the human person walks a via dolorosa. Ours is an incarnate faith, not a symbolic one, and the suffering of the world — all of it — is integral to living it. The varied and hidden sufferings of the human heart reveal a reality that transcends individual circumstances: suffering is real and suffering is painful. To deny this is to deny the reality of human experience and pretend that suffering is a casual anomaly from which we must attempt to escape. While it may be an anomaly in the order of grace, all suffering is significant — significant because it manifests the wounds of our nature and our dependence — our need for redemption. The Incarnation, being first and foremost a participation in the benevolent joy of God who wanted to be united with our human nature and so redeem it, also speaks to the stark reality of human suffering, broadly understood as necessity of one kind or another. For every death there is the necessity of life; every heartbreak the necessity of solace; every darkness of human pain the necessity of light and relief; every privation the necessity of filling its void. Christ became Flesh, so that a deprived humanity might thrive again. It was no easy feat. In fact, it cost His life. Before that final offering he suffered the pangs of a tear drenched sorrow for love of souls. The saints intimately knew this reality of Christ’s Incarnate life. They knew it for themselves and on behalf of others. We might even say they personified it — living so closely united to God — incorporated with Him — as to take on the sensitivity of the Savior’s soul. The greatest saints cry at the awareness of their division from God — their personal sinfulness. They weep for souls whose exercise of freedom brings them further and further apart from an all merciful Love. In the Gospel accounts where Jesus weeps, it is either death or sin that He weeps about. 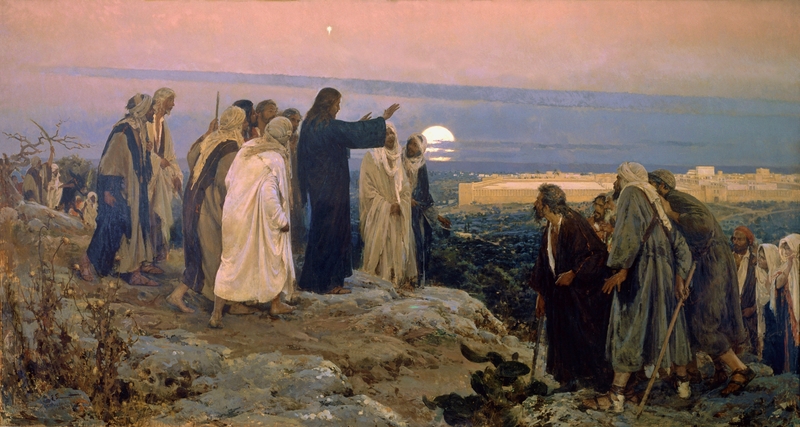 The death of his friend Lazarus drives the Redeemer to groans and tears. The future of Jerusalem leads Him to weep as He overlooks the city shortly before His passion. It may be said that we can most see ourselves as human in the weeping Christ. While He is fully God and fully man, we recognize ourselves in Him most clearly in his tears, and finally in the hours of his agony. As a prism reflects the angles and rays of light, so also the tears of the Savior reflect the interior needs of our souls. Lent prepares us for this reflection. We receive ashes not simply because the cross is an outward sign of our Christian inheritance, but because the ashes themselves substantially manifest what we are apart from God. The choice to accept redemption remains ours — were it not for one tremendous act of love, we would be born and return to the ash of the earth, and that would be the end of our story. For many, tragically, this is the end of the story. Suffering apart from God is unbearable. It crushes the will to live. Despair seeks solace in transitory pleasure, going to great lengths, sometimes to extremes, in pursuit of illusory relief. All the while, there is significant benevolence in the world. While great poverty exists, materially, spiritually, there is also great treasure waiting to be sown about in hearts deprived of solace — hearts deprived of God. The tri-part Lenten disciplines of penance, of giving alms and fasting certainly invite our participation in the needs of the world — of the culture we live in. They call us to a greater awareness of the forms of poverty that besiege both body and soul, everywhere and near to us. But they also do more. They invite us to peer into our own hearts and identify the root cause of our sufferings. Beyond the wounds of material lack, and betrayal, beyond hunger and the thirst for love, beyond privations of varied forms, and beyond death itself, we see that we have need for is the One who answers each of these agonies with Himself. Hope is wrapped in ashes and watered in tears, but it longs for the eternal. and return to the LORD, your God. Return to me that life may live in you again. Return to me, that your thirst may be quenched. Return to me, that in the depravity of human betrayal you may find reason to trust again. Return to me, you whose tears are dark like the ashen sky, and see the radiance that lies on the other side of despair. Return to me, that the illnesses that plague your wearied bodies and your laden souls be the portals to hope! Return to me, you who have been christened with the oils of gladness, and marked for salvation. Return to me, and do not dethrone me, lest in doing so you end the one lingering tie to life. If Jesus Christ and He weeping is not the answer, then there is no other. If in Him is not found Hope, elsewhere there is only Despair. Return to me! And behold your Savior who weeps for love of you. For Hope is ultimately Jesus Christ. And the tears that fall, dark like ashes, will soon reflect the glory of the an olden Easter morn.